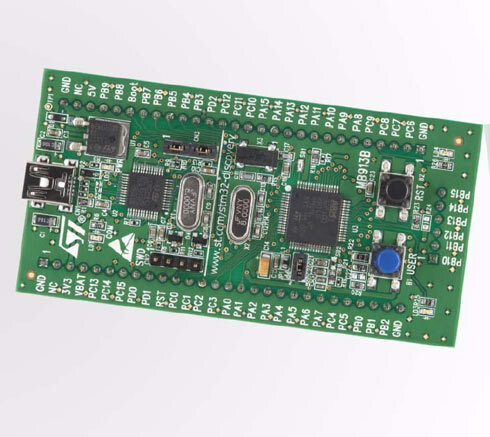 ST now has a Discovery evaluation board for the STM32 ARM chip, only $12 at Mouser. This entry was posted on Wednesday, September 22nd, 2010 at 8:33 am	and is filed under dev boards. You can follow any responses to this entry through the RSS 2.0 feed. You can skip to the end and leave a response. Pinging is currently not allowed. EVALUATION PRODUCT STATUS. The Evaluation Product allows You only to evaluate and test the ST products. You are not authorized to use the Evaluation Product in any production system, and may not be offered for sale or lease, or sold, leased or otherwise distributed. If the Evaluation Product is incorporated in a demonstration system, the demonstration system may be used by You solely for your evaluation and testing purposes. Such demonstration system may not be offered for sale or lease or sold, leased or otherwise distributed and must be accompanied by a conspicuous notice as follows: “This device is not, and may not be, offered for sale or lease, or sold or leased or otherwise distributed”. RESTRICTIONS. You may not sell, assign, sublicense, lease, rent or otherwise distribute the Evaluation Product for commercial purposes (unless you are an authorized ST distributor provided that all the other clauses of this EVALUATION PRODUCT LICENSE AGREEMENT shall apply entirely), in whole or in part, or use Evaluation Product in production system. Except as provided in this Agreement or in the Evaluation Product’s documentation, You may not reproduce the demonstration software or related documentation, or modify, reverse engineer, de-compile or disassemble the demonstration software, in whole or in part. The board you show on the picture is the STM8S Discovery board not the STM32LV-Discovery board. The STM32 board looks different!!!!! I also apologize to whomever submitted the tip, I lost the mail and can’t figure out who to credit. I got the tip in my email from ST’s newsletter, and then I tipped you. It’s a pretty awesome deal for $12 and whatever it takes to get people into ARM chips (I really like the Cortex M3) the better. Also, Leaf Labs has the Maple that uses the STM32. I like the publicity it’s getting! @Roland. You’re wrong, what is shown in the picture is STM32VL-Discovery board, you can also written in the middle of the board. LOL, this so called “license agreement” from STM has no legal power, it’s complete BS. I don’t know how they think they can pull this sort of stunt, but if they think they can put this legal BS onto customers I won’t be using any ST products. Where can I buy this in Europe/Italy at affordable shipping costs? Don’t know about shipping cost, maybe try an italian ST distrib.